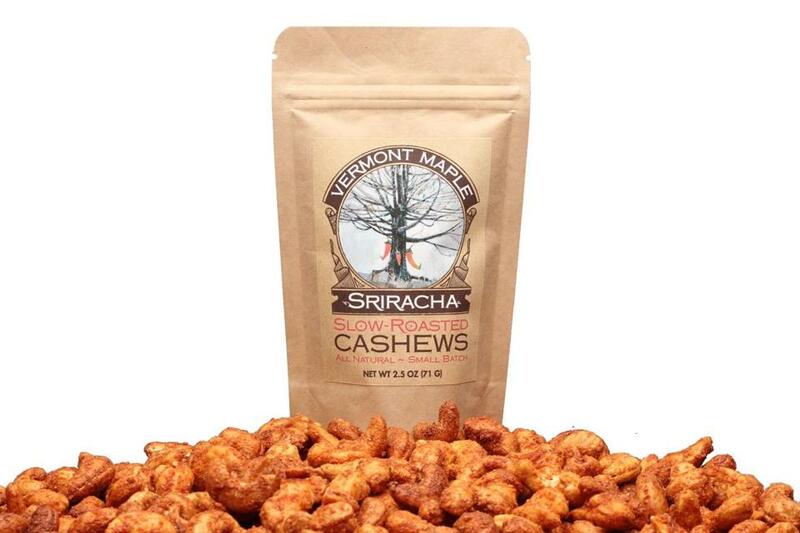 “Waste not, want not” inspired these sweet and spicy cashews ($4.99-$7 for a 2.5-ounce package), the latest product made by Rutland, Vt., partners Jackson Whelan and Lenny “Big Lenny” Montuori of Vermont Maple Sriracha. The pair had developed two maple-sweetened sriracha sauces free of sulfites and cane sugar: Original ($10.99-$15 for 8 ounces), made with red fresno peppers, maple syrup, cider vinegar, and garlic, and Verde ($9.99-$15 for 8 ounces), made with green jalapeños. “As we started making more sauce, we realized we had this byproduct,” Whelan said. “The seeds and skin of the pepper had a nice flavor, but they weren’t going into the bottle. We’re always composting, but Big Lenny started taking it home and dehydrating, and made a ground spice mix.” Whelan’s wife, Madelyn Erb, a landscape architect, baked some cashews with the spices. “Big Lenny took that recipe and ran with it to make our slow-roasted cashews.” The nuts are crunchy, spicy, and addictive. Like the sauces, they’re a delicious balance of heat and sweet, with a little tang and an underlying hint of maple. Available at Newburyport Olive Oil Co., 50 Water St., Newburyport, 978-462-7700; Gogo Gifts, Boston Logan Airport (Terminal C, Level 2, by Gate 25), Boston, 603-682-3082; or go to www.vermontmaplesriracha.com.